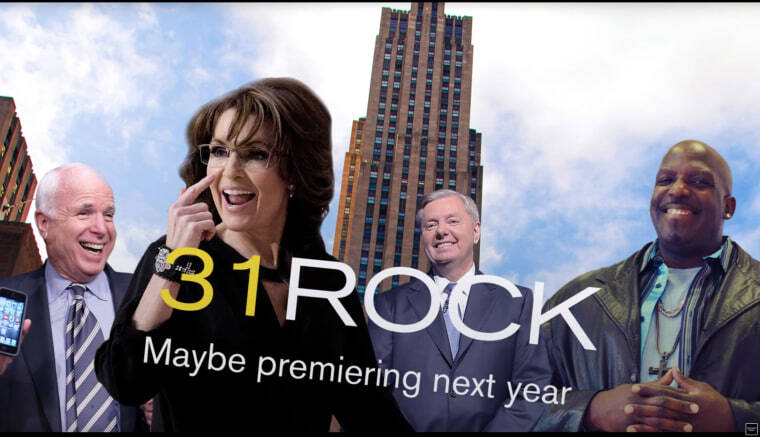 31 Rock, by Independent Journal Review. Tina Fey forever left her stamp on the 2008 presidential race with her skewering impression of Sarah Palin on "Saturday Night Live," but now the former Alaska governor is trying to have the last laugh. In a parody trailer for "31 Rock," created by the Independent Journal Review, Palin puts her own small-town twist on Fey's beloved Liz Lemon character, complete with demands for Big Gulps and complaints about a Starbucks cup without snowflakes. A narrator says Palin's character is "putting the smackdown on political correctness" -- right before a plug for the 2008 vice presidential nominee's newest book. The video also features cameos from Sen. Lindsey Graham and Palin's former running mate, John McCain.